Hey ! It doesn't work in my app. No errors in the code but I don't have the extras line. it means no link with bigtext. my mail : mimeticsounds@gmail.com thank you for your reply ! because your device android version is less than 4.1. So, it will not be shown. 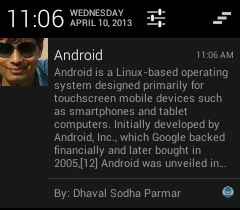 in which version of android OS? Bro Is there any way that the notification will show always in full view no need to expend it to read the full message manually in the notification bar. you can't expand it by default. Documentation says : "A notification's big view appears only when the notification is expanded, which happens when the notification is at the top of the notification drawer, or when the user expands the notification with a gesture." 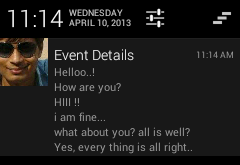 but, you can try trick becoz first notification in the notification tree is always presented with the expanded view. but its still not displaying the complete notification .. what am I doing wrong ? hi, What should be the max size for image in bigpicturestyle? can we use both big picture style and big text style in a same notification. I want to show text (line break) along with the image! No, we can't combine both style.. But you can do with custom notification. can we use both big picture style and big image style in the same notification. I want to show text(with line breaks) along with the image! cant get this style when app is not ruining.only when app is ruining ? 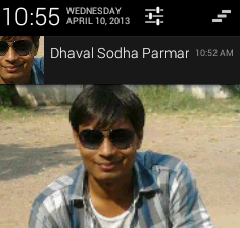 Hi Dhaval, I have followed the instruction properly. But the expanded bigTextStyle is not working. I am testing in a lollipop device. What could be the main reason behind this?. It works great but only when my activity is in foreground. If i'm on android home, application not in foreground, a notification in old style appears.